For years I stopped cooking with mushrooms altogether after my husband had a bad experience. At the time, he was living in rural China when it all went down. The mushrooms were bought from the local supermarket, cleaned properly and cooked thoroughly. Everything seemed ok but little did he know that some mushrooms were somehow contaminated with the spores of another more dangerous fungi. Unfortunately for him, he spent the next 36 hours sweating buckets, sick from purging and with audible hallucinations. As a result, our household was mushroom free for years until we left China. Now that we’re away from mushrooms that make you trip balls (and not in a good way), we have slowly started re-introducing them into our diet. I can now add them to my arroz con pollo, breakfast omelettes, sweet soy and chili rice noodles, and even soup. 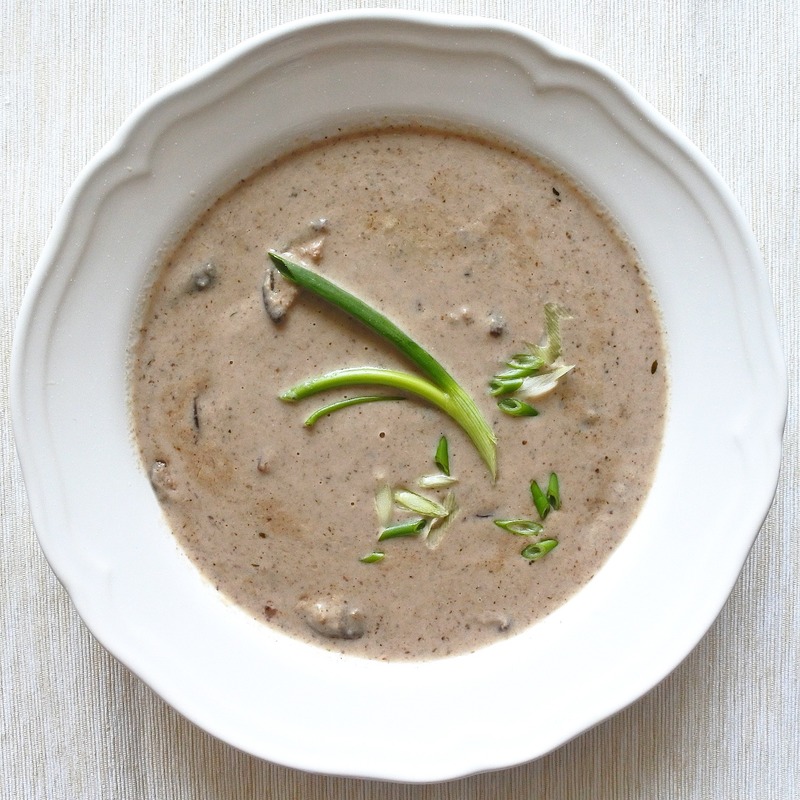 Mushroom soup, however, is one of those dishes, which I love but have always struggled to add flavor to. I’ve added bacon to the mix with mixed results. I’ve experimented with various herbs and spices and a sundry assortment of liquors. I’ve even tried my hand with different types of mushrooms-button, cremini, King oyster, shitake, enoki, you name it. Nothing really hit the spot until I gave up recipes and just free styled it by adding some of my favorite ingredients: lemon zest and fresh thyme. This combination works wonders for the soup. I find it tastes better the next day so feel free to make it ahead of time. You can keep it in the freezer for a rainy day or even the day before if you are having a dinner party and looking for a starter to warm up and serve. Goes great when paired with crunchy garlic bread and a crisp white wine. Using a dampened cloth, wash the mushrooms and remove the fibrous stems. Slice them up and put in a bowl. Set aside. Heat 2 tbsp butter over low-medium heat in saucepan. Add minced shallots, minced garlic and fresh thyme and cook on low-medium heat until soft and fragrant. When ready, add mushrooms and sauté until they have darkened, are soft and all the moisture as been cooked off. Increase the heat and deglaze the pan with 1 cup white wine. Bring to a boil and let reduce by about 1/4. Add chicken stock and cook on medium high heat for about 7-10 min or until all flavors have married together. Reduce heat to low and add cream and lemon zest. Stir and let cook for 3-5 minutes on low to allow the cream and lemon zest to infuse into the soup. Using a blender or food processor, take half of the soup out and puree it. Add pureed mixture back into the soup, mix well and cook for 1-2 minutes. Season with salt and pepper to taste and garnish with chopped scallions. Serve with a crisp garden salad and cheesy garlic bread. Enjoy!